For 16 years Donella wrote a weekly syndicated column called “The Global Citizen,” commenting on world events from a systems point of view. It appeared in more than twenty newspapers, won second place in the 1985 Champion-Tuck national competition for outstanding journalism in the fields of business and economics, received the Walter C. Paine Science Education Award in 1990, and was nominated for a Pulitzer Prize in 1991. 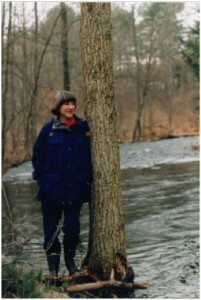 In 1996, Donella founded the Sustainability Institute with the mission of fostering transitions to sustainable systems at all levels of society, from local to global. The Institute adopted the name of its founder in 2011 and renewed its commitment to the organization’s original mission and to making Donella’s work easily and broadly accessible. We humans are smart enough to have created complex systems and amazing productivity; surely we are also smart enough to make sure that everyone shares our bounty, and surely we are smart enough to sustainably steward the natural world upon which we all depend. Three qualities that Donella combined brilliantly were dedication to scientific rigor, deeply grounded optimism, and the ability to communicate well. Her system tools enabled her to see clearly the root causes of seemingly intractable problems — poverty, war, environmental degradation, unsustainable growth — and her deep affection for people and the earth gave her a unique power to reach others. We believe the world needs more people with this combination of skills.